When job hunting, your résumé has a way of highlighting little career imperfections in black and white. Maybe you’ve job-hopped, had a long gap between gigs, or earned a degree that requires explaining (hello, art history majors!). 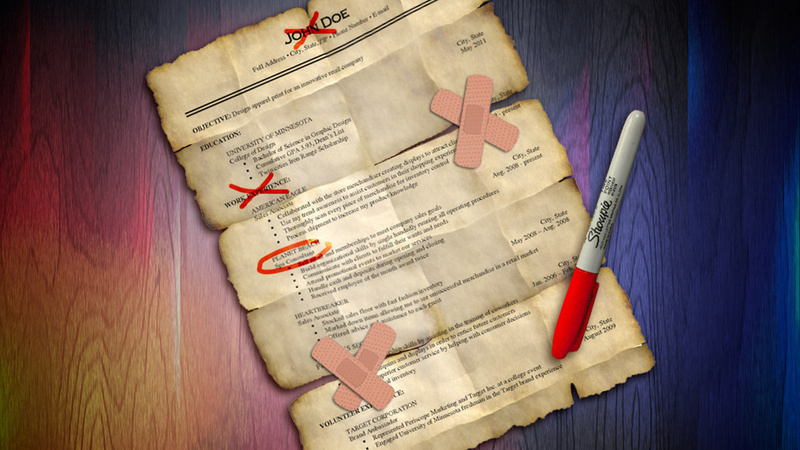 Is there a way to smooth over these résumé imperfections—without being dishonest? You betcha. You just have to get creative, be upfront, and do a little rebranding. We spoke with job coaches, recruiters, and candidates who have been in your shoes to find out how best to fix six of the most common résumé flaws. What to Do: Play up your skills, not your positions. "What skills have you gathered in your previous positions that would be helpful in another job?" asks Lea McLeod, a career coach and the founder of Degrees of Transition, a job coaching firm. That’s just what she did with her client, Todd Mauvais, 29. Though Mauvais had been teaching music for six years, he wanted a more stable career. He applied to government jobs for a full year before he intended to make his transition, but nothing panned out, and Mauvais wasn't sure why. Once he began working with McLeod, the problem was clear: He didn’t lack skills—he simply hadn’t identified the right field to apply them. "Because Todd had a job where he commuted among multiple schools to teach arts classes, he was an exceptional self-manager," she says. "He also promoted summer arts programs to increase enrollment, was a great public speaker and presenter, and was comfortable in front of a room." She helped him recognize that this skill set translated perfectly to a career in sales. Mauvais rewrote his résumé to focus on his relationship building, speaking and promotional skills, and reached out to a craft beer distributor he thought would be a good fit throughLinkedIn. In just over a month, the former music teacher was hired as a sales associate, and is still happy in his role there today. What to Do: If this describes you, don't worry, you're hardly alone. "Only specific fields—like engineering, graphic design, health care/medicine, pharmaceutical and automotive, to name a few—require related degrees for entry-level work," explains corporate recruiter Dennis Tupper. "Otherwise, companies are seeking someone who is coachable and moldable, will work hard and has a vested interest and passion in the company or industry." Taylor Brady, 23, faced this very challenge with his sociology degree. Having grown frustrated after three months of sending out résumés for jobs in social work and nonprofits without getting any response, he, too, reached out to McLeod. "I had friends graduating from business school who were Excel wizards and such, but I had to be creative in regards to selling myself," says Brady. He also led his résumé with a "Special Skills" section, which highlighted the key points of his past internships (including grant writing, donor database management and volunteer coordination), then provided more information about each role in the “Work Experience” section. With McLeod's help, Brady found his current role as a grant writer at a nonprofit by rebranding his résumé to focus exactly on what he could do for his potential employer. "One solution is to list just the number of years or months you worked at your earlier positions, rather than the usual start and end dates," Knittel advises. The other approach? "You can also use a functional résumé, which elaborates on your skills, instead of a chronological résumé. This will take the focus away from time, and on to your abilities and what you can do for a company," she says. If asked in an interview about the time frame of your résumé, you will still need to be honest about the gaps, but either of these approaches can de-emphasize them on paper. What to Do: Jessica Bedford, a recruiter at Artisan Creative, a staffing agency that specializes in finding jobs for creative talent, recommends thatjob-hoppers include a "Reason for Leaving" next to each position, with a succinct explanation like "company closed," "layoff due to downsizing" or "relocated to new city." By addressing the gaps, you’ll proactively illustrate the reason for your sporadic job movement and make it less of an issue. "If you have multiple gaps or have filled the time with several temporary projects, you might also create a section called ‘Consulting Work’ or ‘Freelance Work,’ and list all of them under the one section. With this approach, job seekers can account for a number of years at once," recommends Bedford. If you stayed at a job for only a matter of months, consider eliminating it from your résumé. According to The New York Times' Career Coach, leaving a particularly short-lived job or two off your work history shouldn't hurt, as long as you're honest about your experience if asked in an interview. What to Do: Tupper says that if you work in an industry unrelated to one you worked in ten years ago, you can omit the details of that past experience and include only the years and industries in which you worked (so you don't appear deceitful in the case of a background check). For jobs you held several years ago that are in the same field, but don’t reflect your current "level," keep descriptions brief. And, as mentioned above, in the advice for job hoppers, jobs you held for only a few months can be eliminated, as long as you're upfront about the experience if the subject comes up. What to Do: If little professional experience is the reason your résumé is lacking, executive recruiter Bruce A. Hurwitz of Hurwitz Strategic Staffing recommends adding a subhead called "Related Employment Activities," right under "Work Experience." "You can fill it with volunteer work, online courses, short-term employment and consulting assignments—list everything from a part-time job to a webinar to an online course," says Hurwitz. This section allows you to explain why you’re the right candidate for the role—before a recruiter concludes you’re not. Don’t forget to include the valuable "soft skills" job candidates tend to underestimate, like the ability to resolve customer service issues, work with ambiguity, coordinate among different groups and negotiate with vendors.